Sunday: Passing shower or storm. Late clearing. Muggy. Highs in the 70s. Sunday Night: Partly cloudy. Lows in the 40s and 50s. Monday: Mostly sunny. Highs in the 70s. 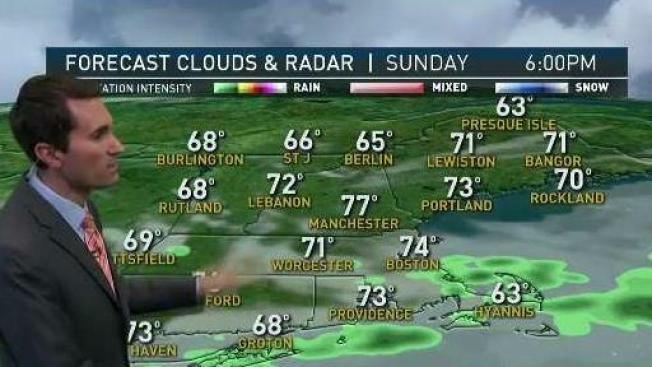 A whole new air mass moved into New England overnight, leaving us with a mild and muggy Sunday. Highs today will reach the 70s to near 80, despite the fact that we’ll have more clouds than sun for most of the day. A cold front will slice through New England, however, triggering a passing shower or storm. The risk of a shower or storm is highest from 9 a.m. to noon in Northern New England, noon-3 p.m. in Worcester County and on the North Shore, 2 to 4 p.m. in Boston, and 3-5 p.m. for Cape Cod and the Islands. Behind the front skies will partially clear and humidity will drop. That trend will continue tonight as lows slip into the 40s and 50s for most. Monday looks beautiful, with tons of sunshine and low humidity. Highs will reach the 70s to near 80. A few more clouds return Tuesday, along with a spot shower. Highs will be in the 60s and 70s. While far away, it still looks like Memorial Day weekend starts better than it will end from a weather standpoint.